The Pokémon franchise first reached Finland on October 21, 1999 in the form of the first English Pokémon games, Pokémon Red and Blue Versions. The Pokémon anime followed shortly after with the first broadcast of Pokémon! Minä valitsen sinut! in Finnish on MTV3 on November 6, 1999. Finland was the first Nordic country to air the Pokémon anime. Denmark, Norway and Sweden followed after in spring 2000. All of the core series and spin-off Pokémon games have been released in English in Finland, usually the same day as the release in the rest of Europe. The first ones were Pokémon Red and Blue, which arrived in Finnish stores on October 21, 1999. All games have their instruction booklets translated into both Finnish and Swedish. The only game released in Finnish is Pokémon Trading Card Game Online, but only the interface had been translated and the cards themselves remained in English. Stores known for distributing Pokémon events in Finland are GameStop, Anttila, Prisma, Stockmann and Pelimies. 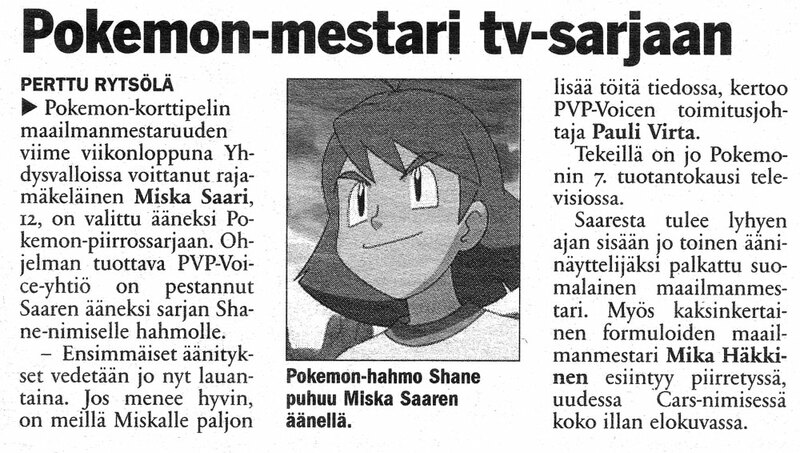 Generally, episodes of the Pokémon anime air on Saturday and/or Sunday mornings on MTV3, a Finnish commercial TV channel. Pokémon Diamond & Pearl: Battle Dimension has aired in Finnish on Jetix. When Jetix was replaced by Disney XD, Disney XD began to show reruns of Battle Dimension as well. Disney XD has also aired the tenth, eleventh, and twelfth movies. MTV3's net-TV known as Katsomo started to upload the 11th season beginning on 11 May 2010 and finished the season in July 2010. New episodes were downloaded Mon-Fri by 18:00. The 12th season started to be broadcast by MTV3 in September 2010, and finished on August 6th 2011. Katsomo started to upload the 13th season since 18 April 2011 and finished on August 11th 2011. New episodes were uploaded Mondays and Thursdays by 18:00. Like some other European channels, MTV3 showed the first two episodes of the Best Wishes series as a "sneak peek" before the seasons actual airing. These episodes were shown on 22 and 25 April, respectively. The season officially started airing on August 13, 2011. Sub Juniori has started to return the first ten seasons of the series since 12 April 2010. Currently, it is broadcasting the reruns of Pokémon: Advanced. Many episodes were not shown in Finland for unknown reasons. The last episode of the first season and the entire second season were skipped; and only about a half of the Johto Journeys, Johto League Champions, and the last 12 episodes of Master Quest were shown. This happened also to Pokémon Advanced, as only the first 26 episodes were shown. This changed during Advanced Challenge, as it was the first-ever season to be shown completely in Finland. Every season after that has been broadcast in their entirety as well. In Finland, the anime is available on Netflix. Pokémon: Indigo League MTV3 Pokémon! Minä valitsen sinut! Pokémon: The Johto Journeys MTV3 Näpit irti Totosta! December 15, 2001 Miksei sadetta kuulu? Pokémon: Johto League Champions MTV3 Miten käy Goldenrodissa? Pokémon DP: Battle Dimension Jetix Pelon kyyneleitä! February 14, 2009 Uneton Canalave Cityssä! Pokémon DP: Galactic Battles MTV3/Disney XD Kierroksia Rotomiin! June 7, 2010 Gible kiipelissä! Pokémon DP: Sinnoh League Victors Disney XD Kotikenttäetu haltuun! February 28, 2011 Suloiset muistot kestävät! Pokémon: Black & White MTV3 Zekromin varjossa! April 22, 2011 Taistelu maanalaisesta! Pokémon BW: Kilpailevat kohtalot MTV3 Elesa, sähköistävä salinjohtaja! July 6, 2013 Unova selviytymiskriisissä! Pokémon BW: Seikkailut Unovassa (ja kauempana) MTV3 Kaunottaret ottelemassa maineesta ja kunniasta! February 16, 2014 Unelma jatkuu! Pokémon-sarja: XY MTV3 Kalos, paikka jossa unelmat ja seikkailut alkavat! May 4, 2014 Puolustaja Bonnie! Pokémon-sarja: XY Kalos-seikkailu MTV3 Polkuja esityskumppanuuteen! December 5, 2015 Katseet kohti tulevaa! Pokémon-sarja: XYZ Pokémon TV Operaatio Z! May 12, 2016 X:n, Y:n ja Z:n legenda! Pokémon-sarja: Sun & Moon Pokémon TV Alola uudelle seikkailulle! August 26, 2017 Kun alueet törmäävät! Pokémon-sarja: Sun & Moon – Ultraseikkailuja Pokémon TV Kohtaaminen unessa! June 22, 2018 Toinen Naamio-Royal? The aired episodes were originally dubbed in Finnish by Oy PVP-Voice Ab from seasons 1 to 7, a dubbing company known of its numerous dubbings on different cartoons. Seasons 5 to 7 were recorded in a former small municipality of Kisko (nowadays part of the town of Salo) in Southwest Finland instead of capital Helsinki. SDI Media has dubbed the series since Pokémon: Battle Frontier; season 8 was dubbed by Dubberman. A unique feature of the Finnish dub (and other Nordic dubs) is that the names of Pokémon moves have been left in English. This hasn't always been the case, but this came into effect when the seasons 9 and 10 were aired in Finland. The reasons behind the change are a bit hazy, but it has been assumed that this is because the Pokémon games and TCG are published in English in Finland as well. At the same time, it has been inconsistent whether Abilities are translated or not. Until season 8, the names of the moves were said in Finnish. In the Finnish dub, several different voice actors have appeared. Sari Ann Moilanen was the original voice actress for Ash Ketchum in first and third seasons and the first four movies, though now he is voiced by Hanna Leino. Kiti Kokkonen is the most recent voice actress of Misty, and also Jessie's voice actress in some seasons before season eleven, though both of these characters have had a few other voice actresses in some point: Misty has also been voiced by Outi Alanen, Marjut Heikkinen (also May's voice actress in seasons 9 and 11, as well as Fennel in BW036) and Pauliina Virta, while Jessie has been voiced by Mari Laari, Karolina Blom and Susa Saukko. Kiti Kokkonen has, though, also been the first of Misty's voice actresses. Brock was originally voiced by Juha Paananen in the first six seasons and after that by Jari Salo. Paananen made a surprise comeback in the beginning of season 12 with voicing Canalave City's Gym Leader Byron in two episodes. Velimatti Ranta is James's original voice actor. Other voice actors for James are Anssi Känsälä, Antti Jaakola, Saku Mäkynen and Peter Pihlström, who is his current voice actor. Meowth has been voiced by Pauli Virta and currently by Arto Nieminen. May has been voiced by Aksa Korttila in seasons 6, 7 and the most of season 8, while Elise Langenoja has voiced Max from seasons 6 to 8. Mirjami Heikkinen is the voice actress for Dawn, while Iris's voice actress is Saara Aalto. Cilan is voiced by Petrus Kähkönen, who has previously voiced some recurring characters and characters of the day. Gary Oak has been voiced by Pasi Ruohonen, among other voice actors. Pasi Ruohonen had also voiced the narrator for many years, but starting with season 18 the narrator is voiced by Markus Bäckman. Serena is voiced by Alina Tomnikov, Clemont is voiced by Henri Piispanen (who had previously voiced Shamus and Keldeo), and Bonnie is voiced by Henni-Liisa Stam (except the last 3 episodes of the XY series, where she was substituted by Saara Lehtonen). Stam had also voiced May in the last seven episodes of season 8, and some minor characters. In the Sun & Moon series, Lana is voiced by Ella Tarvonen, Kiawe is voiced by Vili Orava, Lillie is voiced by Saara Lehtonen, Sophocles is voiced by Susa Saukko (also Jessie's current voice actress), and Mallow is voiced by Yasmine Yamajako, who previously voiced Alexa and Hoopa Confined. Rotom Pokédex is voiced by Markus Niemi. Professor Kukui is voiced by Ilkka Villi, whose previous major roles include Stephan, Colress, and Professor Sycamore. Also, the Eleven to Fourteen bracket winner in Pokémon Trading Card Game 2006 World Championships, Miska Saari, has voiced Shane, the character of the day in the episode That's Just Swellow. All the movies up to the eighteenth movie (excluding Lucario and the Mystery of Mew and Pokémon Ranger and the Temple of the Sea), as well as the anime specials Mewtwo Returns and The Mastermind of Mirage Pokémon have been dubbed in Finnish. The fifth, sixth, and seventh movies were dubbed by a completely different dubbing group and cast, similar to the Netherlands. Out of all the Pikachu shorts, Pikachu's Vacation, Christmas Night, Kanga Games, Pikachu's Rescue Adventure, Winter Games, Stantler's Little Helpers and Pikachu & Pichu have been dubbed in Finnish, as well as the special episode Pokémon Mystery Dungeon: Team Go-Getters Out of the Gate!. Some series, published by VIZ Media, are sold in English by Fantasiapelit, a company that also has other Pokémon merchandise, such as TCG cards, in their product range. On July 25, 2014, Finnish publisher Pauna Media started publishing the Red, Green & Blue chapter and the Yellow chapter of Pokémon Adventures under the combined title Pokémon Adventures: Red, Blue & Green. The first volume was published on July 25, 2014. There are plans to release the entire series. However, the original publishing schedule of one volume per month hasn't held up, and only the first five volumes have been released so far. Three movie adaptations, Pokémon Ranger and the Temple of the Sea, Giratina and the Sky Warrior, and Zoroark: Master of Illusions have been licensed by another publisher, Sangatsu Manga. The mangas were published on January 13, March 11, and May 6, 2016, respectively. No Pokémon manga has been translated into Swedish, Finland's other national language. Many card sets of Pokémon Trading Card Game, starting with Base Set, have been sold in Finland in many different kiosks and convenience stores. Lehtipiste stores, the most common being R-Kioski, are known as one of the most reliable places to find Pokémon Trading Cards. Theme Decks are also sold in Finland. The cards sold in Finland are in English, and the price of one booster pack is typically around five or six Euros. At least one Masters division World Champion, Tom Roos, is from Finland. Roos's deck was later printed in promotional form and named Legendary Ascent.